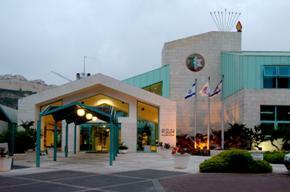 The Beit Halochem Center in Jerusalem opened in 1994, for the benefit of the members of Zahal Disabled Veterans Organization living in and around the Jerusalem area. The facility grounds encompass some ten acres of beautiful landscaping, in the south-western part of Jerusalem, between the new suburbs of Gilo, Malcha and Givat Masua, with a panorama of the Judean hills. The construction of the facility was made possible through the contributions of Friends of Beit Halochem Organizations, from all over the world, and especially, by virtue of the 5.5 million dollar legacy bequeathed by the late Aladar and Iby Fleischman. The 6,750 sq. meters Jerusalem stone complex boasts a large multipurpose gymnasium, an indoor swimming pool, auditorium, physiotherapy treatment and fitness rooms, classrooms, tennis courts, shooting range, table tennis, billiard hall and spacious parking lots. 3,500 disabled veterans are currently enrolled at the Center. Together with their families, the Center serves some 9,000 members.